See Nepal treks and India treks for our current treks. + means summitted the peak. Back by popular request, we had a "Kanchen Gola Wild" trek of yesteryear. We trek off the map to explore the wild snow leopard areas around remote Yangma then pop over the scenic Nango La to Ghunsa where we say goodbye to our kitchen crew. Then we lodge trek up to Kanchenjunga North Base Camp (still with porter support). Naturally we scramble a 6000m viewpoint and even sleep out under Jannu. From the middle hills to the remote alpine under the world's #3 peak, this is adventure+ in an area we know and love. Comparing that past experience and other treks I think the Kanchenjunga trek was the best I have done. The area above Yangma in particular was just stunning. Success! We topped out on the Kang La /(Ghari La) and found two other passes unmarked on maps. The GHTer (the next trek down) made it to Makalu Base Camp and Jamie with Esther made it to the alternative start point for the GHT, the Kang La pass on the Sikkim border. As with our Ladakh season, the weather was not the best, although this didn't mess with our itinerary. In the low country, it was fine both on the way in and way out but in the high country it clouded over sometime in the afternoon, often with a dusting of snow. Before you blame climate change entirely, there have been occasional October-November seasons like this years ago. Sometimes, it is just luck of the draw (but perhaps with a bit of climate change also thrown in?). The first half of the trek was full service camping and we explored up to the Nepal-Tibet border to the Kang La. This is marked on maps as the Ghari La, however some digging by Roger found this could instead be the Ghan La, and when we asked the locals, they said the real name is simply the generic Kang La (and it must be noted the spellings by Nepali surveyors up there are tone-deaf and disinterested), which means snow mountain pass, and it certainly was that. We also found another desperate pass that is unmarked on maps but does see occasional use, and found yet another that is frequented by blue sheep (and snow leopard? ), so we had some productive exploring from the Pabuk region. And those mountain views! 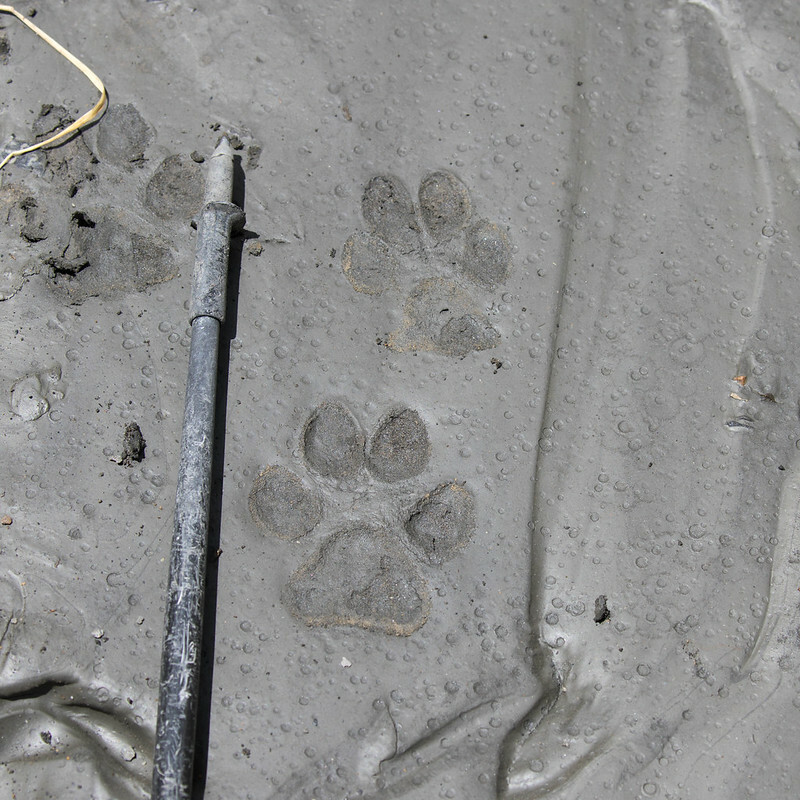 Returning from Yangma to where our two teams split a little before the Nango La, we saw fresh fox and snow leopard prints in the snow dusting. The GHT team returned to Walung (Olangchung Gola) in a long day, while our "Wild" teams crossed the Nango La and easily reached Ghunsa, to begin our trek switching from camping to lodges. Roger Nix has a big Flickr album of the first half of this trek, the start to our point of the GHT separation (the trek below). Also see Carsten's Google Earth screen shot of our route. Ghunsa was a little indoor luxury recovery, some of the team even had showers (and some didn't!). At our Khangpachen stop, Celesta, Esther and myself tented at Jannu BC instead and were treated to a chilly night, blue sheep (but no snow leopard) and that ever changing light on massive Jannu. Lhonak is still basic and on the edge for teahouse trekking and Pangpema is marginal, and having tents with us definitely helped. The views were incredible though. On the return to Lhonak, myself and Carsten climbed the 6000m viewpoint with others turning back part of the way up. The weather wasn't good and we should have started far earlier (my bad call). In hindsight, that viewpoint shouldn't be treated as casually as I did. Sadly, Bengt had been suffering back pain for some days and no treatment or medication or time seemed to be helping so he was heli-evaced out. Once back at Ghunsa at Himali's well set up lodge, the "Wild" team of Carsten, David and Greg headed back the quick way to Taplejung while the Double Wild team headed over Selele to the south side. Both Jim and Celesta suffered real coughing fits, which I would attribute (perhaps indirectly?) to a build up from smoky lodges, lodge hygiene and perhaps trail dust. They partially recovered in Tseram while Esther and I headed up to investigate the Khang La pass to Sikkim. It was a delightful valley and it was particularly satisfying for me to reach the top of the pass as I feel this is the best realistic start/end point for the Nepal GHT if starting/ending on the border. Returning to the lower altitudes Yamphudin, everyone recovered somewhat, and over the journey back to Kathmandu. Carsten has two Flickr ablbums, Western Valleys (Olangchung Gola-Yangma) and North Base Camp. Remote Yangma, Lumbasamba and Makalu Base Camp; wahoo, another 42 day special. We explore "off the map" together the the Kanchenjunga Wild team, and when they turn to teahouses, we continue with the kitchen crew along the trek routes we pioneered all the way to Makalu Base camp. High and wild authentic adventure at the best time of the year. After splitting with our main group above, the "GHT" team made it without issue, but plenty of adventures along the way. It is a fairly major achievement to trek this route without getting lost as it barely used. See Greg's photo albums and also a Greg Danforth's map of their route. Roger Nix has two Flickr albums, here is the second half, the Lumba Samba and GHT route to Makalu BC. An intimidating part of the the GHT high route, Tilman's Pass links the Langtang and routes to the east. Just a quick email to say thank you for all your help and services for our holiday in Nepal. I've been thinking of crossing Tilman's pass since 2009 and your team helped us achieve our goal - to be honest we completely couldn't have done it without them. Kami Sherpa was attentive, supportive and a great leader of the team. Gombu Sherpa effectively acted as a second guide as well as a cook and was also really good. The porters and the kitchen boys were excellent as well. I think it was also an adventure for them and they all said it was a much tougher trek than the usual Everest Base Camp/Annapurna type treks. We thoroughly enjoyed all our time in Nepal and hope to do something again with you in the next year or two. We had a marvelous time. Everything went well and there were no problems. No difficulty in getting lodging as our timing seemed to be perfect for avoiding bigger groups. We actually didn't see that many trekkers, and not big groups. The food was generally fine for us too, actually seemed better in the higher elevations. We lost some weight, which is not a bad thing for us! Our general perception was we were glad to be doing the tea house approach. (We brought too much stuff though). I think we missed you by a day in Ghunsa as we headed to Selele La. Also, the weather was near perfect; some folks we met that were a few days ahead of our schedule were not so lucky as they had poor views at north and south base camps. Tawa, Arjun and Tchering were fabulous - hard working, friendly, humble etc. We truly enjoyed their company and would recommend them to anyone. Tawa was flexible and I think we took 2 or 3 days less than the itinerary. We hope we gave them generous tips. Nabin was most helpful too - really appreciate him "holding our hand" while working thru delayed luggage problem the first couple days in Kathmandu. And he was great in setting us up to go to Pokhara for a few days after the trek. You may have heard, an Israeli fellow hooked up with us in Ghunsa on the way up. We had seen him in Chiruwa where he was waiting for some new boots; since his companions had to go on, he did not have a guide. Ronen is a great fellow whose company we enjoyed, and Tawa was most gracious in allowing him to join us. He is a professional photographer - see his website or Facebook pics - Ronen Golan. Thanks again; we are glad we connected with you and Expedition Himalaya. Our spring Everest Base Camp trek was cancelled after the main mover had an accident. We ran a full series of Ladakh treks, even squeezing in a Kilimanjaro holiday! Our Parang La upgrade, with a 6000m scramble. This is a sublime panoramic wilderness trek in dazzling light to Kibber and Ki Gompa with our unique detour wandering where wolves and snow leopard roam. We get 6000+m high and cross a few secret passes with some trademark exploring, then back to the more usual Parang La for a cultural Spiti and Shimla-Delhi end. Adventure from start to finish! Trekking is the journey, and although I worried about the relative sameness of the terrain through our desolate area, everyone else really appreciated the stark, open terrain then the variety the Parang La and the Spiti road trip provided. Exploring, we found our almost unknown 2004 pass and crossed it, and with a further link to our 2014 route, we have linked up all the possible routes in the area and have material to document the little-known passes. Crossing the desolate "empty quarter", I was worried about the days of similar terrain, although this was broken up by our 6000m scree slog up (Thank you Lobsang, especially, for assisting Ranjan meet his goal). The feedback was otherwise though, with the openness and the Zanskar range castles a highlight. With few stones to trip on, we ate up distances on the smooth plains, so quite different from most other Ladakh and Zanskar areas. Although we didn't see as much wildlife as I would have liked, we did see Tibetan Argali sheep and kiang, and a fox and others. No wolves this time. The road trip from Kibber to Shimla was an eye opener, first the incredible terrain of Spiti, driving along an old trading route and passing through ancient villages that have had road access for decades. Then, closer to Shimla, the development, the HUGE hydro projects, and the holiday hill stations overrun by domestic tourism, including Shimla itself. The toy train and a further train to Delhi rounded out the whole experience. while the smooth running was evident on the trek, looking back on my holiday snaps I really appreciate the spaces and places that we visited. 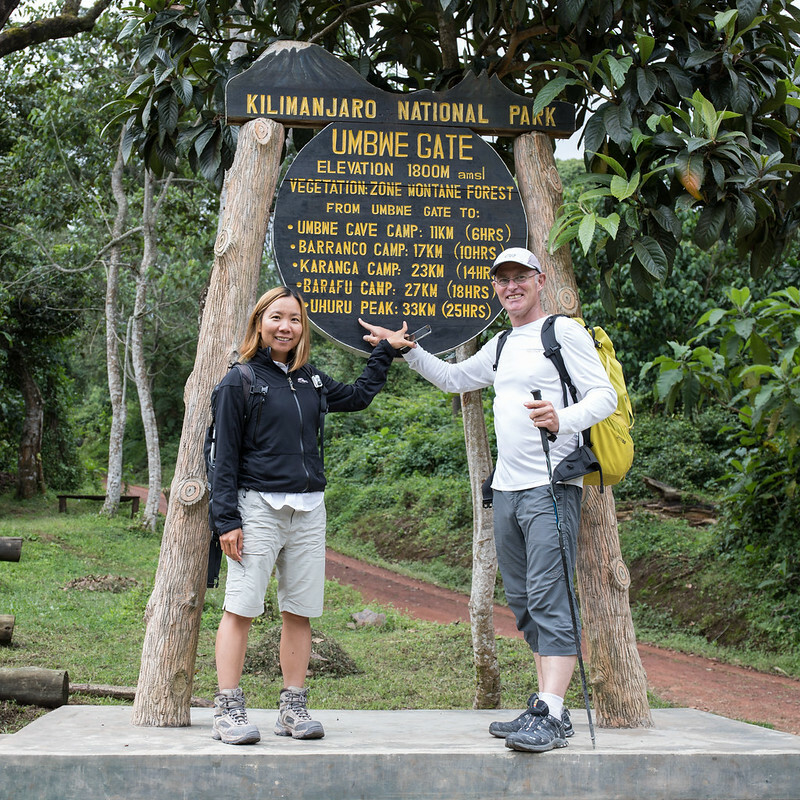 Esther and I climbed Kilimanjaro between treks. Since we were already acclimatized, we chose the Umbwe route as this gains altitude so quickly that most people are put off. We were the only team at our first camp. Barranco was huge and filled with hundreds of people, and we realized how lucky we were. We then branched off for the steep Western Breach route, whichhas some rockfall danger, so again we had several peaceful camps. In a few places the Western breech involves scrambling with your hands on rock with good holds, so you want to have a good sense of balance. In August, there was no snow so we didn't need crampons. I tried to hurry our guides, however we were fitter than them, as there is a real rockfall danger and little warning at night. Rockfall doesn't often hit the route however there is a definite risk and we were thankful the company provided helmets. It was also here we witnessed altitude folly. A couple of obnoxious guys arrived late into Arrow Glacier camp having flown up the mountain in three days ignoring the altitude. At 3am we passed them in a heap, slurring words and not being able to stand straight, as far as we could work out in the night (we didn't hang around for rockfall reasons). They must have descended sick, I hope they lived to tell the tale. It was only discussing withour guide later that I realised the guides don't carry emergency altitude drugs, due to the risk of being sued. Would Diamox (and dexamethasone) have helped them? Undoubtedly, although they might have been so stupid as to have continued climbing. Does Diamox really work? Yes. At the last minute Griffin, a friend of previous trekker Kees Terhell, joined us. Unacclimatised. So he took Diamox twice a day (125mg to 250mg each time) for the whole trip, we added an extra day's acclimatisation, and he felt good the whole way! And we finished with a standard but surprisingly good safari nearby, I was amazed at the abundance of wildlife; in Nepal and Ladakh it is elusive. Trails less trekked... Backpacking is trekking, carrying all your own gear and camping out in the most amazing Ladakh wilderness camps, but with the satisfaction of still helping the local economy. We share the tricks and neat itineraries that ease in the rigours, and luxe out at our resupply breaks, every detail perfectly planned for a satisfying trek with minimal preparation time. You bring your personal gear, we provide the tent, stove, fuel and supplies for you to carry! Trails less trekked... For the first two sections these were exploratory and we didn't meet another trekker, indeed only one bemused shepherd. It was ambitious to explore on our very first true backpacking trip, however we did and we discovered two passes unmarked on the Olizane map, the first by accident! Our first two sections were tough, with longer days but perfectly graded sleeping altitudes as we built up acclimatization. After a day's rest at Tso Kar (where Jen from the previous trek also popped in), with Lobsang expertly filling our bellies, we peaked out at over 6000m a couple of times, particularly satisfying as these were personal bests for Tomie and Lesa (who can be especially proud as a cancer survivor as she has a few bits of lung missing!). The weather was sometimes not very pleasant, at least once we had camp set up, but didn't upset our itinerary. This was also a surprisingly good wildlife trek. Dozens of kiang, curious domestic yaks slipping by our camps, marmots, curious and shy pikas and voles. Those are the usual, but we also saw the rarely seen, an owl during daytime, two wolves with their tails between their legs, perhaps we scared them while they were hunting blue sheep, which we spotted a moment later. We also watched relatively immature white-neck feather vultures (Himalayan Griffons) feeding on a marmot, a real highlight for Esther and Jamie. The group wildlife highlight had to be our Nat Geo lunch spectacle of two kiang going at each other, hard out racing each other until we were breathless just watching, then a neck-biting finale still in front of us, and all while we simply ate lunch. It was also a trek of variety, each section wildly different scenery and character from the last, covering all of the main trekking zones, much appreciated by all. On the supplies side, Lesa and Tomie showed how good home-dried meals can be, showing up what was available in Leh, which isn't much. We have some work to do there. See my 2017 Ladakh Skypacking 6k Flickr album. After the hilltop gompas and forts of the Markha Valley, we get remote and wild in the domain of blue sheep and their predators, snow leopards and wolves, and cute pikas and marmots, and even the free roaming kiang. We cross high and wild passes, and scramble the hills beside for a real adventure. From hot to cold, and from voles to kiang, everyone rose to the challenges for a real adventure. We didn't see as much wildlife as I had hoped to, however it was still a great trek. Our route was a variation of our Markha trek with the remote end. From Markha we ascended the rarely trekked Rabrang La into an unspoilt, remote valley that at certain times of the year does hide wildlife. We narrowly missed seeing a snow leopard, we found what looked like rather fresh prints, and we did see blue sheep (their food) and kiang and the cutest pikas. We also found voles (Stoliczka's mountain vole, Alticola stoliczkanus) and Esther saw a relatively rare type of pika (but no photo). Across Zanskar has always been the classic trek; we avoid the new roads with two adventurous variations that few dare for mesmerizing views, adventurous canyons, stunning wild camping and pretty villages. Rugged, colourful rock contrasts with the azure rivers and green village oases. Ancient monasteries cling to rock faces and Buddhist chortens dot the immense landscape. It is the updated classic and one of the very best adventure treks there is. What an adventure, start to finish! Thank you, everyone, for joining, and to our superstar crew. As Fred said, the level of adventure or perhaps difficulty is British-style understated above. Those river crossings, the passes, even the bridges, and just the whole experience! The heavy later winter falls of snow were evident driving out of Leh, and were a feature on most pass crossings too. I envisaged our first couple of days to be less than exciting given that we were simply following the Tsarap Chu (river) as we acclimatized, however each day in Shun had it's own character and was interesting trekking, sometimes above the river, sometimes close to the roar of a river almost in flood, exploring dicy bridges. The first major river crossing was only mid-thigh deep, luckily far from the chest deep Lobsang once experienced. We had timed it well. The first pass was a tough but rewarding slog, the elation of pass success dampened by a horse dying on the pass, apparently of altitude sickness. The horses had acclimatized similiar to us, including three days at 4400m before meeting us, so this was surprising to everyone, but Teej did admit it was this horse's first time to Ladakh. A distressing scene. After the first pass, as the jagged mountains randomly stretch into the distance, the Ladakhi saying really is self--evident: "Only the best of friends or the worst of enemies come to Ladakh". A curiously long, scenic traverse brought us to a camp hacked out of the hillside (thanks, Kim!). Dropping into familiar territory, we were soon at the remote village of Shade where it rained for our rest day, although that didn't dampen the Scrabble competition or reading. Thankfully our double pass day was less eventful than our first pass, although apparently, the locals had scared and driven on a bear in the direction we were heading three days prior. We shared a stream with nomads who came and explored our camp - and we explored theirs, petting baby yaks and watching the mother naks being milked, a delightfully natural experience. The second major pass of the trip was the 5160m Pangdang La, and instead of the flowers of last year, much of the top was snow-covered, some great boot skiing for those who dared. Thankfully, the waters of this canyon afternoon cooperated, with fun crossings and we made it to Zangla Sumdo before the stream rose too high. Missing were the ibex of last year, indeed on this trek we saw little wildlife, other than blue sheep at our acclimatization camp as we left Leh, and one other spot, and a variety of birds. The crew did see and scare the bear by a side stream though. Then those impossibly steep-sided canyons down to Zangla... The river had not really dropped and so we had to work our way around several normal crossing points and even pull out a rope for a couple. The crew were fantastic though, Lobsang, the bear, standing in the river helping trekkers across, and the others forming a chain to support on the most challenging crossings. It really was a particularly satisfying day, and perhaps the last day for descent for a while as the stream continued to rise. A bear still featured on the Lingshed section, three shops had been broken into just days before we arrived, biscuits and uncooked rice seemed to be the favourite. Thank goodness it didn't learn to open the beer as we needed some "sports recovery beverage" by this stage. We had the most delightful lama-gompa experience at Lingshed then some harder trekking in real rain as we took an unplanned trek over the Singge La as the road was awash and boulder-strewn. Among the many highlights I have to mention the meals, the delightful dinners with a real variety of non-greasy dishes, Raj was an awesome cook - thank you. And thanks, Mike, for the whiskey! Mike Farris has a good photo album on his personal site. You can fly in and out - but it is a real adventure to overland both ways ... ! We summited Mera Peak on Wed 12 April, at approx 0730. Glorious weather, Everest, Makalu, Lhotse, Kangchenjunga all on display. I think only one westerner summited on each of 10 and 11 April. We had 2 large parties of Thais and Koreans climbing with us, we passed most of them and 3 Koreans were at the summit crux when we arrived. We were lucky with the weather, there was plenty of afternoon mist on the trail before 10 April and it snowed at Khola Kharka 4200m a few days later down the trail. Walking out over the high pass and past the lakes was wonderful. First couple of days were easy, just as well as part of me getting fit on the job. Then the track got a bit steeper with plenty of ups and downs. Until we met the hikers from Lukla coming over the pass we were alone in the bamboo jungle apart from the odd local. Had a couple of "rest" days on the way up at 4300m and 4900m, went for day hikes and slept back at the same altitude. The acclimation process went well, just one headache at Mera La 5300m, was gone the next day.